Now, I’m not a big nail polish fan, mainly because I’m very impatient and would basically have to dedicate a whole night to just painting my nails and watching it dry between coats. And we all know how long that can take. Frankly, ain’t nobody got time for that! Also, free nights are pretty rare for me. I’m either too busy with deadlines, school, and poetry – or I’m too lazy and I end up watching YouTube videos while eating a bag of chips (and we all know you can’t paint your nails and dive in a bag of chips at the same time.) But THIS nail polish is perfect for the busy (but kinda lazy) girl like myself. Let’s start with the packaging. It’s the standard nail polish bottle with the company name in the front. In the back, it shows the list of ingredients: Water, elthylene glycol, styrene, and proprietary copolymer. Not gonna lie, I’m comforted in knowing that there are only 4 ingredients in here. Next, the color. Through the clear bottle, the color has a marbled look of light and dark pink, but don’t think it’s not mixed well. It’s supposed to look like that, and it comes on vibrant and consistent once you put it on your nails. Now for application. Holy moly this stuff is nice. The first coat is opaque and bright. Because of this, I got lazy when I put it on my toenails and just left it at one coat. But, I painted my thumb nail to give you all a nice swatch. The great thing about the Tuesday in Love nail polish is that it dries really quickly. In less than 30 minutes you can be out the door, digging through your purse, or playing with your hair. There is no fake dry feel, only to fall asleep and find sheet prints on your nail beds. Your nails will still look shiny and new after that nap. Did I mention the high shine? No need for a top coat on this baby. 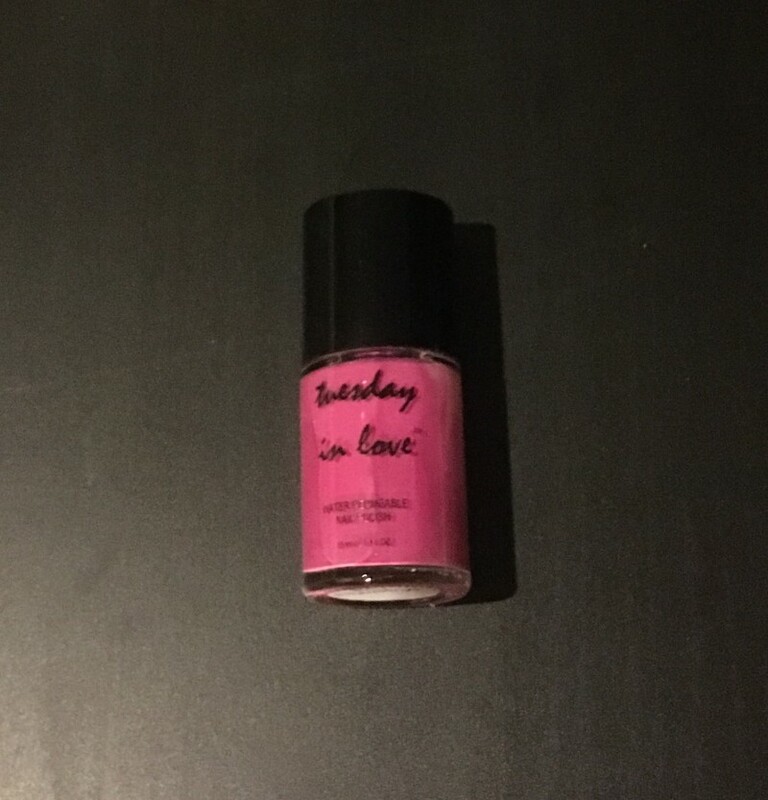 The Tuesday in Love nail polish lasts forever. Remember how I said I put the polish on my toenails? Well, I applied one coat and left it at that. New York has been windy, rainy, and recently had a snowstorm, so I was putting on all different types of shoes and walked around everywhere. And guess what ladies – the polish is still in perfect tact, and the color and shine have not dulled! If you have been on the fence about getting this halal nail polish, I’m giving you an honest review of how great it is. You can also watch some YouTube videos that test the permeability of the polish using a paper towel and water. Videos show it compared to other nail polish products that are not permeable, having water run through the Tuesday in Love polish, while another name brand polish did not soak through the paper towel. Having said all that, I highly recommend this be the product you put on your nails. It’s so fabulous. My favorite has to be the Muslim Girl Pink, (I may be a little bias, though), but honestly, all the colors are so great. Enjoy your colorful nails, ladies! I know I will be! They’ve got a new non-peelable formula that’s even better! Love the new shades 🙂 And it’s still water permeable without having to rub the water in like some of the other brands.